The Norwegian railway system comprises 4,087 km of 1,435 mm (4 ft 8 1⁄2 in) (standard gauge) track of which 2,622 km is electrified and 242 km double track. There are 696 tunnels and 2760 bridges. Jernbaneverket is a state owned agency which builds and maintains all railway tracks, while other companies operate them. These companies include Norges Statsbaner (Norwegian State Railways), NSB Anbud, CargoNet, Flytoget (Airport Express Train), Hector Rail, Tågåkeriet and Ofotbanen. 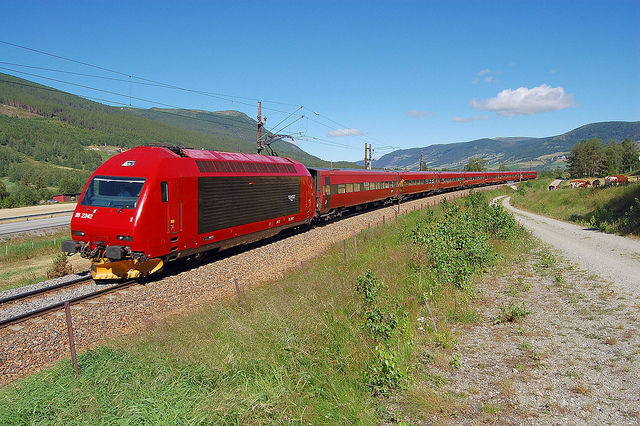 The Norwegian State Railways is the company which is responsible for most passenger train operation. 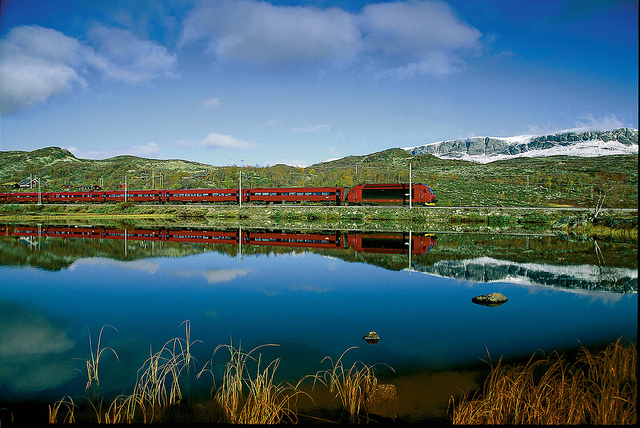 Norway is a member of the International Union of Railways (UIC). 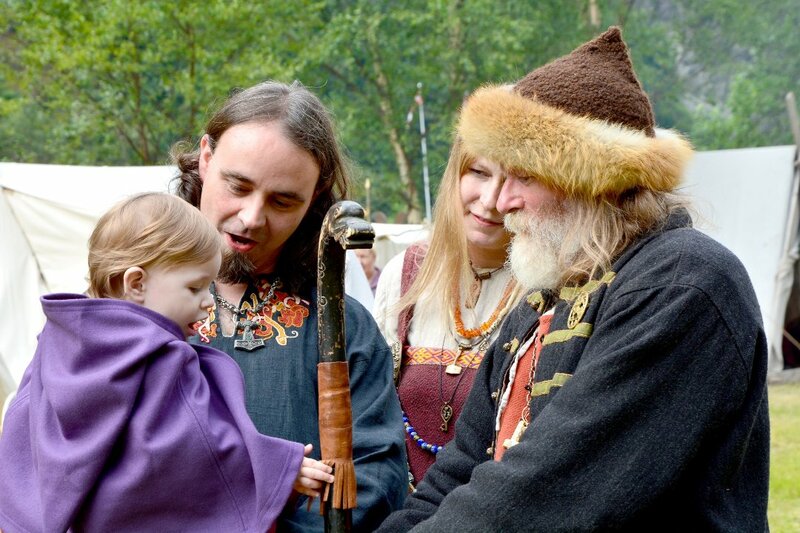 The UIC Country Code for Norway is 76. The first railway in Norway was Hovedbanen between Oslo and Eidsvoll and opened in 1854. The main purpose of the railway was to freight lumber from Mjøsa to the capital, but also passenger traffic was offered. In the period between the 1860s and the 1880s Norway saw a boom of smaller railways being built, including isolated railways in Central and Western Norway. The predominant gauge at the time was 1,067 mm (3 ft 6 in) (narrow gauge), but some lines were built in 1,435 mm (4 ft 8 1⁄2 in) (standard gauge). The height of the era came in 1877 when Rørosbanen connected Central Norway to the capital. In 1883 the entire main railway network was taken over by NSB, though a number of industrial railways and branch lines continued to be operated by private companies. Three urban railways, in Oslo, Bergen and Trondheim, were started as horsecar systems between 1875 and 1893. They were all electrified around the turn of the century. The second construction boom of the main railway arose in the 1910s and included the Bergensbanen across Finse to Bergen, connecting Eastern and Western Norway. Also a number of other larger projects were built through the 1920s, including a second line, Dovrebanen, to Trondheim. This period also saw the first electrified railways and a steady conversion from narrow gauge to standard gauge. Norway chose to electrify their network at 15 kV 16⅔ Hz AC. During World War II there was a massive construction by the German Forces as part of creating Festung Norwegen, including large sections of Nordlandsbanen and the completion of Sørlandsbanen. 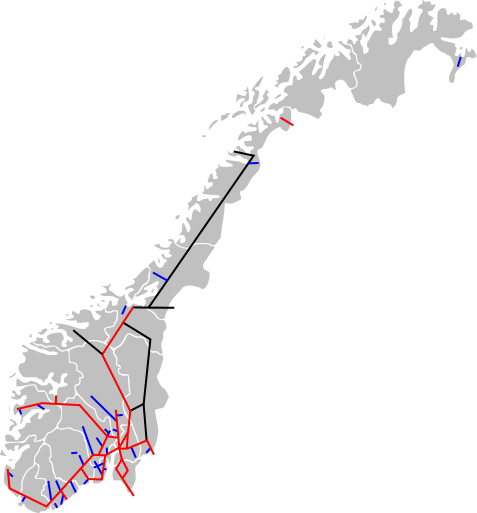 After the war the main effort was to complete Nordlandsbanen (that reached Bodø in 1962) and completing the decision to electrify 50% of the network, a task not completed until 1970. This allowed the retirement of the steam locomotive, being replaced with electric engines like the El 11 and El 13 or the diesel powered Di 3. In 1966 Norway’s only rapid transit, Oslo T-bane was opened, but in the same decade the Bergen tramway was closed. In the 1970s and 80s a lot of branch lines were also abandoned. In 1980 the massive project of connecting the eastern and western railway networks around Oslo was completed with the opening of the Oslo Tunnel and Oslo Central Station. In 1996 NSB was split in the Norwegian Railway Inspectorate, Jernbaneverket and operating company NSB BA. Since the companies have been split into 10 separate companies and corporations. In 1998 the first new line in 36 years was opened when the high-speed railway Gardermobanen was opened to allow travel at 210 km/h between Oslo, Oslo Airport and Eidsvoll. The 1990s also saw the massive introduction of multiple units on passenger trains. In the 2000s the freight segment was deregulated and a number of freight companies have started competing with the NSB partial subsidiary CargoNet. The main railway network consists of 4087 km of lines, of which 242 km is double track and 60 km high-speed rail (210 km/h). In addition there is 225 km of urban railways, of which 218 km is double track. In addition there are some industrial tracks and minor branch lines and some abandoned and heritage railways. The entire main network is 1,435 mm (4 ft 8 1⁄2 in) (standard gauge), as are the urban railways in Oslo and Bergen. Of the operational railways in Norway, only the Trondheim Tramway has a different gauge, the meter gauge, 1,000 mm (3 ft 3 3⁄8 in). Some heritage railways, though, operate with various kinds of narrow gauge. Kirkenes-Bjørnevatnbanen used to be the northernmost railway in the world, but was in 2010 beaten by the Obskaya–Bovanenkovo Line in Russia. Still, Narvik is one of the northernmost towns in the world to have a railway connection, as the terminus for Ofotbanen. It connects to Kiruna, Sweden, but not to Bodø, the northern terminus of the Norwegian railway network. Kiruna is, however, connected to the Swedish railway network, which again is connected to the Norwegian network at the Swedish station of Charlottenberg, Storlien and Kornsjø.